4 x 60ml freezer and microwave safe pots. Soft push up base means frozen food pops out easily. Store home-made baby food simply and safely with leak-proof lids. Perfectly sized portions handy for baby's first solid foods. Tray for easy storage in fridge or freezer. Dishwasher, microwave and steriliser safe. BPA free and suitable for babies 4 months plus.Introducing your little ones to solid foods can be fun, with a world of flavours and textures to explore. 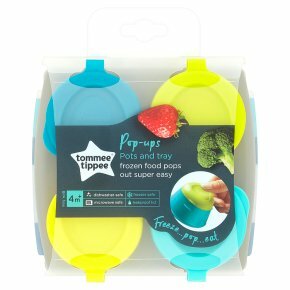 These pop up freezer pots and tray help make weaning easy. Perfectly sized for their first little meals, they make storing home-made baby food safe and simple. No-spill lids mean no leaks and mess, and the soft push up base makes it easy to pop out portions ready for baby's mealtimes. The tray helps keep everything organised in your fridge or freezer, so perfectly sized portions are on hand whenever you need them. Cleaning Before first use, clean the product. Clean before each use. Always wash the product immediately after use. Wash in warm soapy water and rinse in clean water or use a dishwasher (top shelf only). Do not clean with solvents or harsh chemicals. Do not store with or allow to come into contact with solvents or harsh chemicals. Do not allow product to come into contact with oil based foods (e.g. oil/tomato based sauces) as staining will occur. Not suitable for use in a conventional oven or a combination microwave oven with the grill feature switched on. Do not heat in a microwave with the lid sealed. Remove lid before placing in a microwave. For your child's safety and health<br>Warning!<br>Always use this product with adult supervision. Accidents have occurred when babies have been left alone with feeding equipment due to the baby falling or if the product has disassembled. Before each use, inspect the product. Throw away at the first sign of damage or weakness. Always check food temperature before feeding. Heating in a microwave may produce localise high temperatures. Always stir heated food to ensure even heat distribution and test the temperature before serving.<br><br>Keep all components not in use out of reach of children.